Workman Publishing Company, 9780761155584, 256pp. 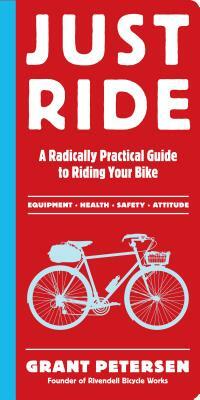 In the same way that Michael Pollan’s slim bestseller Food Rules brought a gust of common sense to the everyday activity of eating, Just Ride is a revelation. Forget the ultralight, uncomfortable bikes, flashy jerseys, clunky shoes that clip onto tiny pedals, the grinding out of endless miles. Instead, ride like you did when you were a kid—just get on your bike and discover the pure joy of riding it. Also includes chapters on Accessories, Upkeep, and Technicalities as well as a final chapter titled “Velosophy” that includes the essential, memorable thought: Your Bike Is a Toy—Have Fun with It. Grant Petersen is the founder and owner of Rivendell Bicycle Works. He has been featured in Outside and Men’s Journal, among other magazines. He lives with his family in Walnut Creek, California, and online at Rivbike.com.